Headed in the right direction with your IRA? As you plan for retirement, you’re faced with many choices. Sometimes you take the right road. Sometimes you don’t. 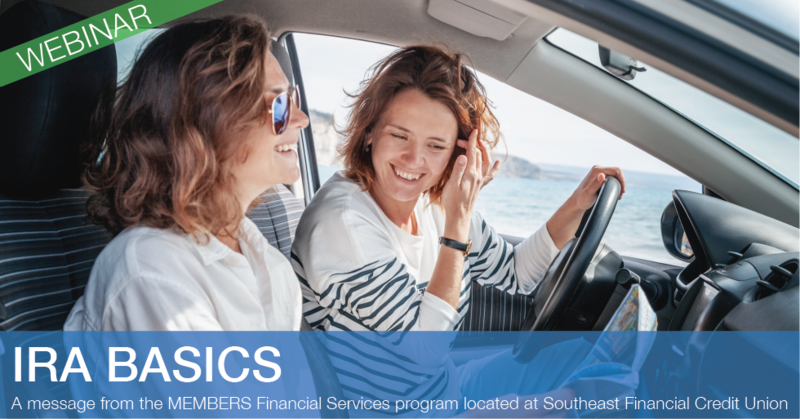 Here’s an opportunity to take the right road and steer toward your personal retirement goals using IRAs. What’s the difference between traditional and Roth IRAs? How do I decide which type of IRA is right for me? When can I withdraw from my IRA for retirement income? Should I consider a rollover into an IRA? How will an IRA fit into my overall retirement plan? Look for new dates in 2020. Interested in scheduling a meeting with one of our financial advisors to discuss IRAs and your retirement plan? Email kwright@southeastfinancial.org. MEMBERS Insurance & Investments and MEMBERS are marketing names for the products, services and programs offered by CMFG Life Insurance Company (CMFG Life) and other leading carriers. MEMBERS® is a registered trademark of CMFG Life. CUNA Mutual Group is the marketing name for CUNA Mutual Holding Company, a mutual insurance holding company, its subsidiaries and affiliates. Annuity and insurance products are issued by CMFG Life, 2000 Heritage Way, Waverly, IA 50677.